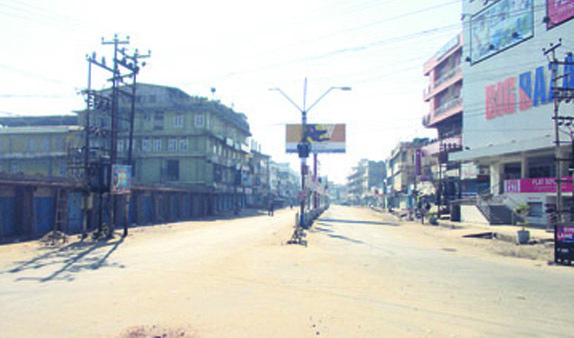 The Joint Coordination Committee of civil society organisations, tribal bodies and indigenous citizens of Nagaland on Sunday rejected the State government’s appeal to reconsider Nagaland bandh and appealed to all the citizens of the State to observe the 10-hour statewide bandh on Monday. In the consultative meeting on February 6, 2019 at Dimapur, it was resolved to observe Nagaland bandh on Monday. The committee, in an appeal issued by its media cell, sought voluntary participation of every citizen of the State in enforcing the bandh as the issues necessitate mass agitation. It appealed to all tribe hohos and gaon burhas to coordinate and monitor the bandh and ensure that no violence takes place under any circumstances. The bandh should be peaceful, it added. The committee said the bandh is a conscience call to the people to rise to the occasion and protect our rights, privileges, dignity and security. It said the people of Nagaland expressed their resentment in the form of mass agitation against the government of India for “dilly-dallying” the conclusion of political negotiations for years. “The Nagas are now feeling agitated for the fact that years of negotiations without apparent solution tantamount to taking Nagas for a ride,” the committee stated. It said the promise of the magnitude of “Election for Solution” by the government of India has turned out to be a ploy to once again suppress the Nagas “tactically”. According to the committee, the Centre is expected to be transparent and more honest with its citizens and not to give false hope and ultimately betray them citing excuses. On the controversial Citizenship (Amendment) Bill, 2016, the committee said the government of India is hell bent in imposing its “political agenda” as the Bill was passed in the Lok Sabha on January 8. The Bill is expected to be tabled in Raja Sabha as a supplementary bill anytime, which was confirmed by BJP national secretary Ram Madhav, it said. The committee said though the people of North East, cutting across political barriers, voiced their vehement opposition to the Bill, it is regrettable that Prime Minister Narendra Modi undertook a visit to few north eastern states to pacify the people. It said no amount of assurances given by the Centre on Citizenship Bill and its implications can dupe the people as there is no mechanism to protect the indigenous people from the menace of the Bill once it becomes a law. The committee felt such relentless lobby for the Bill by the Centre amounts to total disregard to the sentiments of the Northeast people.